A recent national survey of state policies and practices reveals how the United States defines giftedness, identifies giftedness, and accommodates gifted minority students. Today, lots of different definitions of giftedness exist. This wasn't always the case. Prior to 1972, practically every school used one criterion and one criterion only to identify giftedness: an IQ cut-off of 130. This criterion was heavily influenced by the pioneering work of Lewis Terman, who equated high IQ with genius. Then the first federal definition of giftedness came along in 1972, which was undoubtedly an important step forward. Noting that only a small percentage of the 1.5 to 2.5 million gifted school children were actually benefiting from special education services, former U.S. Commissioner of Education Sidney P. Marland, Jr. proposed a broadened definition that went beyond just IQ to also include specific academic and creative aptitudes. That report was important in its broadening of giftedness. A more recent report released by the National Department of Education in 1993 ("National Excellence: A Case for Developing America's Talent") kept the multidimensional definition of giftedness but once again lamented the sorry state of gifted education. In the report, Secretary of Education Richard Riley called gifted education the "quiet crisis." Various psychologists have put forward their own pet theories of giftedness. Howard Gardner proposed eight independent abilities: verbal-linguistic, logical-mathematical, spatial, musical, bodily-kinesthetic, interpersonal, intrapersonal, and naturalist. Robert J. Sternberg proposed a synthesis of wisdom, intelligence, and creativity. Other researchers have added psychosocial traits to the picture. 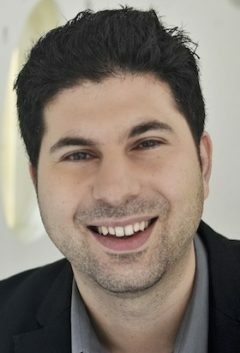 In Joseph Renzulli's Three-Ring definition, giftedness is conceptualized as the interaction of high ability (top 15-20 percent of any domain), creativity, and task commitment. Francoys Gagne's Differentiated Model of Giftedness and Talent (DMGT) includes traits such as motivation and temperament as catalysts that help transform gifts (e.g., intellectual, socio-affective) to talents (e.g., academics, social activists). This all well and good, but what's the reality of the matter? How do states actually define and identify giftedness in the United States? Has anything actually changed since the Terman IQ cutoff-only days? To look at the current state of affairs, Mary-Catherine McClain and Steven I. Pfeiffer recently conducted a national survey of current state policies and practices (soon to be published in The Journal of Applied School Psychology) to assess how states define giftedness, identify giftedness, and accommodate gifted minority students. This is what they found. Nearly all states (48 out of 50) in the United States today have established definitions of giftedness. The two exceptions are Massachusetts and South Dakota, who have no current definition for gifted and talented students. Even so, states differ quite a bit in how they define giftedness. Some states stick with the label "gifted" whereas others use more broad and expansive definitions including "gifted and talent" or "high ability students". There is also indication of a change: 24 states changes or modified their definition of giftedness over the past decade. For example, Indiana's definition changed from "gifted and talented" to "high ability". As you can see, intelligence and high achievement are two of the big winners. 45 state definitions (90%) include intelligence as an area or category of giftedness, and 39 include high achievement. Interestingly, 27 states include creativity (54%). I didn't expect such a large number of states to explicitly include creativity in their definition of giftedness and was pleased to see this. 28 states include a specific area of giftedness, and 15 states include leadership skills. 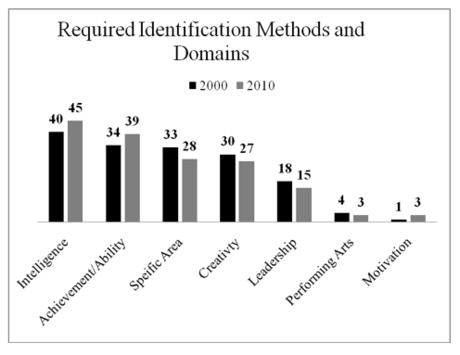 Motivation and the performing arts are seriously lacking in definitions of giftedness, with only three states thinking either of these were an important part of giftedness. Looking at the chart, you can also see that there have been some changes in the past 10 years. But I don't think all the changes are necessarily positive. For instance, more schools now include intelligence in their definition of giftedness, and less schools view creativity as a form of giftedness. Some other notable changes: since 2000, New Jersey, New Hampshire, and Minnesota developed state definitions for giftedness, Maryland added the category of "leadership" and Georgia removed "leadership" and "artistic" from their state definition. So that's how states define giftedness. But what methods do they actually use to identify giftedness? Do they practice what they preach? Again, the clear winners are IQ and standardized achievement tests. The biggest losers are tests of creativity, teacher rating scales, indicators of actual performance, and the use of behavior checklists. Compared to earlier reports, there was only a small overall change nationwide with respect to how states identify gifted students. Interestingly, no state reported using a single IQ score alone to determine whether a student is gifted. This is actually a pretty big deal, and a huge change from just 20 years ago. Most states (54%) use a multiple cutoff or averaging approach. The multiple cutoff model requires that students score above a set score on two or more different measures. The averaging approach is similar to the multiple cutoff approach but the student doesn't have to show the same level of threshold across different domains. Seven states (14%) use a single cutoff: flexible model, in which only one outcome is considered, but school districts can be flexible in terms of which test and threshold is allowable. Sixteen states (32%) report that they do not require, recommend, or adhere to any one specific criteria for identifying gifted students. It should be noted that there is no one best way of identifying gifted students, as each approach has both advantages and disadvantages (more on that in later posts). Most states (64%) do not use specific tests or cut-off scores for gifted eligibility in their state. With that said, Eighteen states do use a specific cutoff on IQ tests, with 15 of those 18 using specific cutoff scores on standardized tests of achievement and 10 of the 17 using cut-off scores in one or more specific areas of giftedness. It is no secret that minority students are seriously underepresented in gifted education programs in the United States. About half of the states recognize that some groups of students are less likely to do as well on traditional methods of gifted identification and would benefit from flexible and non-traditional gifted identification procedures. Most states (26/50) have specific policies for identifying culturally diverse students, and the rest of the 24 states have no specific cultural diversity mandates. 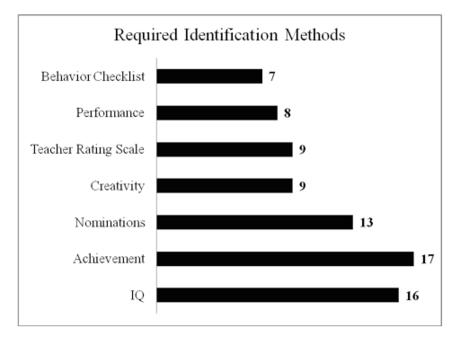 To give an example of such a mandate, Georgia allows educators to use a measure in any area of giftedness when there is clear evidence of culture, language development, disability, or economic disadvantage and the initial test score is within one standard error of measurement or standard deviation of the qualifying score. In looking at these results, a couple things stood out to me. First, there seems to be a mismatch between state definitions of giftedness and how they actually identify gifted students. In other words, many schools talk the talk but don't walk the walk. For instance, I was excited to see that 27 states include creativity in their definition of giftedness, but nearly cried when I saw that only 9 states actually use tests of creativity to identify gifted students. Second, and this is perhaps related to my first point about creativity, the performing arts get the short end of the stick in gifted education. But why? Why are other areas of achievement considered a form of giftedness, but extraordinary musicians, actors, dancers, comedians, puppeteers, etc. aren't considered gifted? Makes no sense to me. Gifted performing artists may be academically unconventional, nonconforming, even sometimes an annoyance for teachers to deal with, but many of those students, with the right support, will end up being part of the next generation of entertainers. Second, I lament that nearly every single state in the United States ignores motivation as a form of giftedness. After all we've learned about the importance of intrinsic motivation, passion, and inspiration in driving success and greatness in the real world, this is a serious poblem. As I've argued before, passion is a gift. In my view, it's just as much of a gift as ability. Third, I was surprised to see that so many states still use specific cut-off scores on IQ and standardized acheivement tests. After all we know about standard errors of measurement, at the very least IQ bands or ranges should be considered, not the precise score. Using a precise cut-off ridigly is neither accurate nor fair and is a form of what I call "testism". I was also bummed that no schools used a dynamic approach to identify gifted students. In a dynamic approach, giftedness is assessed by the amount of growth and improvement over time. The student's score at initial testing is compared with their score(s) at a second testing session, and the amount of change determines their placement. Such an approach moves away from such an intense focus on comparing one student to the next, and appreciates individual development and flourishing. Finally, I was bummed to see that there is still so much disagreement in terms of definitions of giftedness. While it can and has been argued that such a diversity of definitions is acceptable, I agree with the authors that it is not. The psychological research clearly points to a developmental way of thinking about high ability, and there ought to be some sort of unity in terms of how schools align their practices with the latest scientific findings. In fact, the only thing all schools do seem to agree on is that giftedness is a fixed phenomenon-- because no schools explicitly include provisions to constantly re-test all students (those who made the cut as well as those who didn't). Unfortunately, this is the opposite of what the latest research shows about the malleability and constant ongoing development of different areas of expertise. The identification of young students who are most likely to make significant contributions to society remains a critically important goal in American education. Gifted assessment should be a recurring phenomena, not a one-shot event; some students not identified as gifted at an early age later develop the gifts and talents to make major contributions in innumerable fields, and some young students identified at an early age as gifted, for any number of reasons, fall off of a trajectory of academic excellence. Gifted assessment should be multidimensional and multifaceted; school psychologists can play a more central role in gifted identification by conducting a comprehensive assessment which includes measuring not only general ability, but also specific abilities, motivation, interest, task commitment, and psychosocial variables known to impact academic success. A recent report by the National Science Board, "Preparing the Next Generation of STEM Innovators: Identifying and Developing Our Nation’s Human Capital", specifically recommends that educators need to identify all types of talents and nurture potential in all students, including high ability students. This is clearly an important, new opportunity for school psychologists to assume a key leadership role. School psychologists should advocate for any high ability student who demonstrates uncanny ability or potential to make a mark in an academic field, even if their IQ score falls below the school district’s cut-score; there is no single right answer for what IQ threshold or percentage of students should be identified as gifted, and the numbers can change depending upon changing criteria of academic excellence and available resources. School psychologists should monitor the academic progress of students identified as gifted. Many factors play a role at every stage of the talent development process, and any number of things in a gifted student’s life can either enhance or deter the actualization of their potential. The Council of Exceptional Children – The Association for the Gifted recently released a position statement advocating use of growth models for gifted students. To take advantage of this opportunity, school psychologists will need to become familiar with the talent development and expertise literatures (e.g., Ericsson, 1996; Feldman, 2003; Lubinski, 2010; Subotnik, 2003) so that they can design empirically-supported progress monitoring protocols, and effectively identify opportunities and experiences that promote a high ability student’s path toward excellence and making a mark in society. School psychologists can play a key role in advocating for high ability students who often are not identified or served by gifted programs in the schools–students of color, students from financially disadvantaged families, students from families where English is not the primary language spoken in the home, and students from rural communities. All too often, marginalized groups of students with uncanny potential to excel are neither identified nor served in gifted programs. The Thomas B. Fordham Institute published a report exploring the impact of the No Child Left Behind legislation on gifted students. The report, High Achieving Students in an Era of No Child Left Behind concluded that while the nation’s lowest performing students have made relatively steady academic gains in reading and math between 2000 - 2007, those students performing at or above the 90th percentile appear to have evidenced minimal gains, and that the excellence gaps have widened among different racial groups and students of high and low socio-economic status. Hopefully ten years from now, there will be greater changes in gifted education than there have been in the past ten years. These issues are important, and must be taken into consideration if we want to develop excellence. © 2011 by Scott Barry Kaufman. Follow me on Twitter or G+. Helping Kids Overcome Procrastination: Why Wait?